The popular Transit App uses a person’s location, and real-time schedules and locations of transportation services to give an estimate of the best way to make a trip. Including by bike. Transit App, the popular cellphone app that tells you when your next bus or train will show up or where to find a Car2Go, will now show you where the nearest shareable bike is, making it easier to choose the most convenient transit option for a given trip. Transit App uses a person’s location and real-time schedules and locations of transportation services to offer a look at how best to make a trip. Stand at your bus stop and it will tell you when your bus (and any other nearby bus) is coming next. But it also works as a trip planner: Type in your destination and it will give you various options for getting there: bus, light rail, car-sharing services and ride-hailing services, each with an estimated travel time. 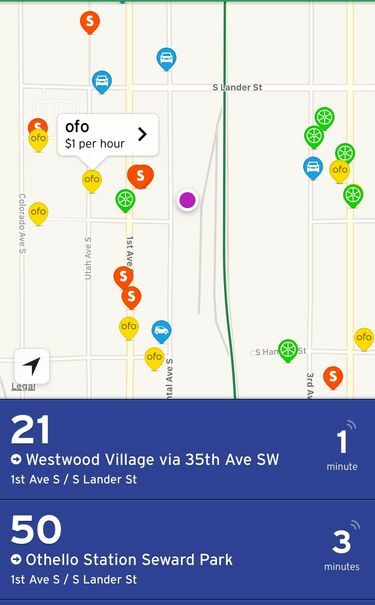 Now Seattle’s three private, stationless bike-sharing companies have been added to the app. The bikes have quickly become ubiquitous in Seattle, especially in neighborhoods around downtown, to the delight of some and the consternation of others. But with three different bike-share companies, there are three different apps and three different maps showing the bikes’ locations. If you’ve got no brand loyalty and just want to find the nearest bike, it can be a cumbersome process to juggle and compare the three apps. So for instance, to make a trip from The Seattle Times on Denny Way to Seattle City Hall, Transit App offers three bus-route options — trip times between 14 and 18 minutes — a 9-minute UBERx, or bike shares with an 18- to 19-minute estimate. Transit App gets the bike-location data from the bike-share apps themselves, so to the extent that locations are off — as they have been from time to time — they will also be off on Transit App. Transit App, which is functional in 125 cities around the world, launched its bike-share integration in Seattle, which has essentially been the American guinea pig for the new breed of stationless bike shares, and Washington, D.C., which opened its streets to stationless bike shares last month.